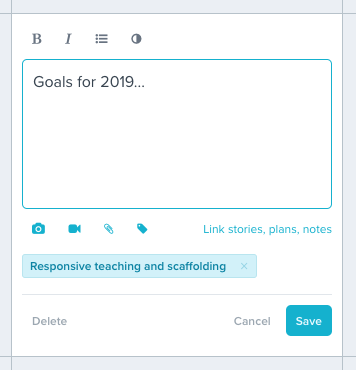 This article discusses adding learning tags to plans. Learning tags are like labels or keywords you can attach to stories and plans that let you ‘tag’ your learning outcomes, goals, curriculum or standards (eg. Early Years, Te Whāriki, International Baccalaureate, teaching standards, appraisal goals etc). Once you've applied tags to a number of stories and plans you can group and filter them by their tags. Learn more about Learning tags and sets. 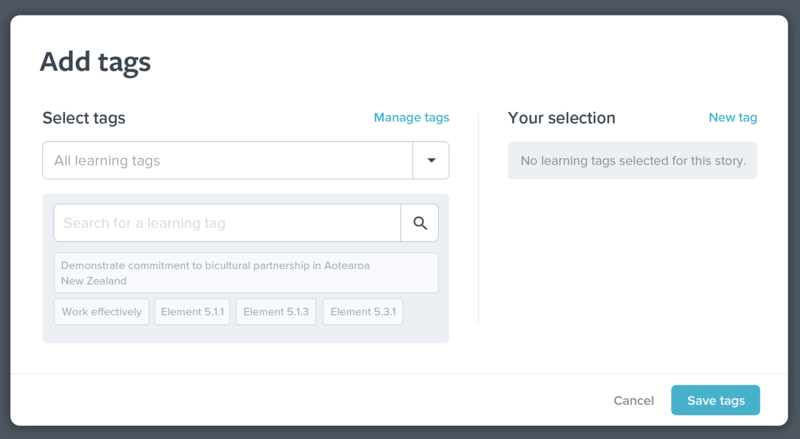 Learn how to manage Learning tags. In any plan, hover over (or tap on a touch screen) any cell to see your editing options and select 'Content'. 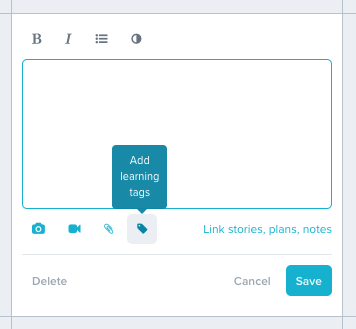 This will be familiar to you if you've previously used learning tags in stories. Just like in the story editor you'll see a panel with two sections. 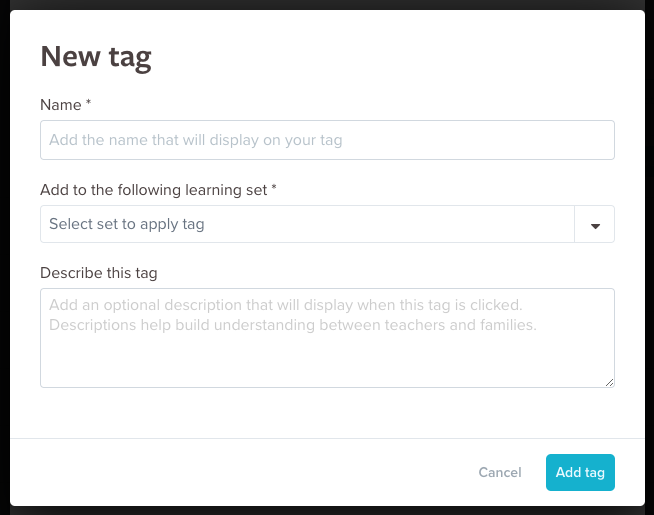 'Select tags' displays all learning tags that your early learning service has set up within your ‘Learning Sets’ page. 'Your selection' displays learning tags that you've selected in this planning cell. You can find your chosen tags by searching under 'All learning tags' or by clicking on the dropdown to select from a specific learning set. Alternatively you can start typing the name of your tag into the search bar until you see it. When you see the tag you're looking for, click it and it will appear under 'Your selection'. You can add as many tags at once as you like. If you make a mistake you can simply remove the tag by clicking the ‘x’ to the right of it. If you wish to add a new tag that doesn’t appear within any of your sets, click the ‘New tag’ link at the top right of the 'Your selection' panel. A panel will appear where you can type the tag name and an optional description which people can read if they click on the tag in a published story. Teachers will also see a ‘Set/folder’ drop-down menu which is where the new tag will be filed for future use. When you've finished editing this cell, click 'Save' and your learning tag will be applied to the planning cell. 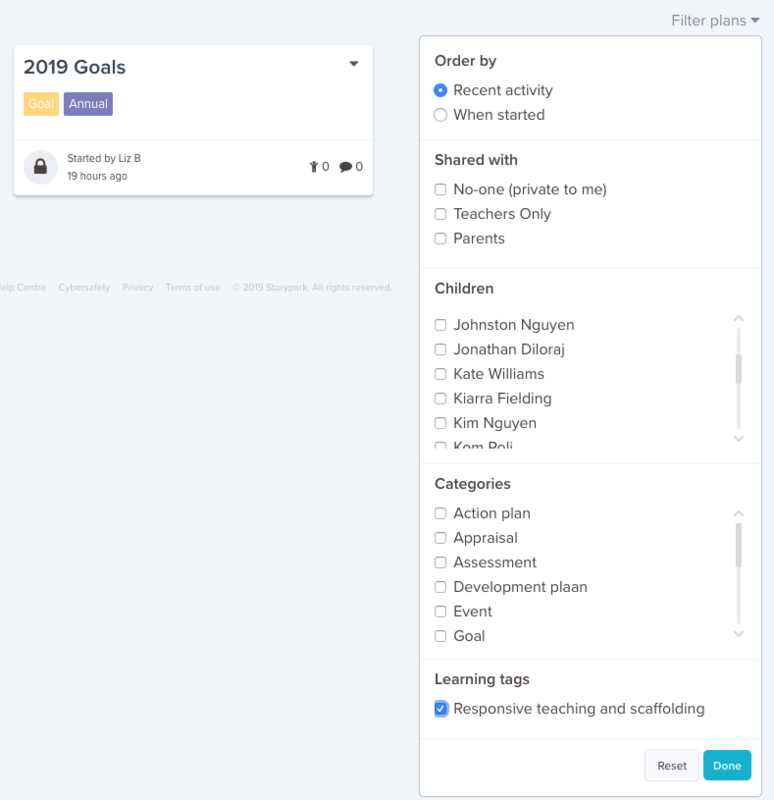 Once you've applied tags to a few plans you can then filter them by their tags (as well as children, categories and share settings) on your main planning page, making it easier to find and group similar or related plans.